Antarctica is a popular tourist destination. Dozens of cruise ships sail there from November to March, when the sun never sets. Tourists pay tens of thousands of dollars for the trip, mostly to see penguins and icebergs. However, if you really want to experience adventure travel to the world’s coldest continent, you need to head 700 miles further south from the coast—to the South Pole. South Magnetic Pole – Currently located off the coast of Antarctica, this is a constantly shifting spot, due to changes in the Earth’s magnetic field. Geographic South Pole – The southernmost point on the planet, located at 90°S, is marked by a small sign and a tall stake driven into the ice. The markers must be moved annually, to compensate for the movement of the ice – about 10 meters per year. The Geographic South Pole is the goal of expeditions and trips. Ceremonial South Pole – Used for photography purposes, this shiny metallic sphere atop a diminutive red-and-white striped pole is located a short distance from the Geographic South Pole, and is surrounded by flags of the Antarctic Treaty countries. The first explorers to reach the South Pole were Roald Amundsen’s Norwegian party, arriving on December 14, 1911. A British expedition, led by Robert Scott arrived one month later, although Scott and his four companions all perished from starvation and cold during their return trip. The Amundsen-Scott South Pole Station was established in 1956-57 for scientific research, and has been staffed ever since by researchers and support personnel. During the austral summer, from November to March, about 250 scientists live at the station. That number drops to between 50 and 60 when the winter season descends, with its constant darkness and extreme temperatures. 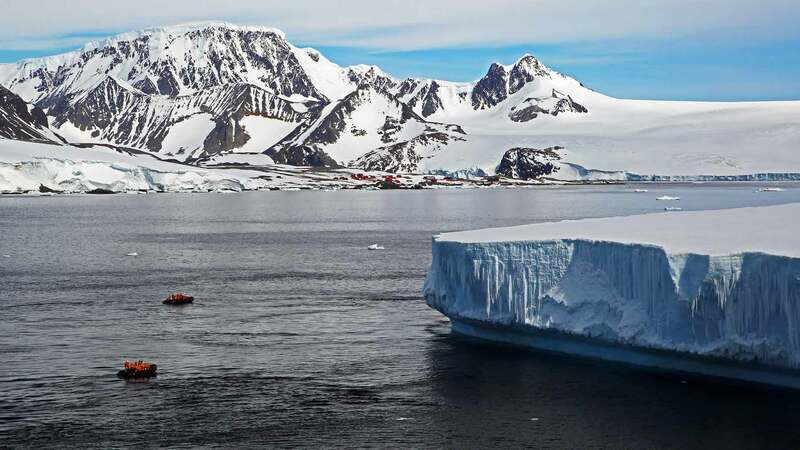 With the box office success of “March of the Penguins” and “Happy Feet,” and the growing popularity of adventure tourism, the fragile ecosystems in the Antarctic are coming under attack. “Penguin tourism” has skyrocketed in recent years, bringing thousands of tourists to a land once thought to be unapproachable. Environmental impacts are already visible: noticeable footpaths have appeared in formerly pristine areas, slow-growing moss beds have been damaged, penguin colonies have been disrupted, and over-eager tourists have been known to illegally walk off with historic or geological “souvenirs.” Some cruise ships or tourist vessels practice careless or improper waste disposal, and the increased ship traffic has resulted in accidents with potentially catastrophic environmental consequences, and expensive repairs. December 1989 – Arved Fuchs and Reinhold Messner became the first people to reach the pole without animal or motorized aid. December 2007 – Hannah McKeand (33) set a new speed record for skiing alone and unsupported, 690 miles to the pole in only 39 days, to raise money for breast cancer research. Trips to the South Pole take advantage of the five austral summer months, November to March, when the sun never sets. Costs cover most expenses once you arrive in Punta Arenas, Chile (i.e., flights to and from Antarctica, guide services, meals and lodging in Antarctica, etc. ).